The Stupava Jewish community, one of the oldest in Slovakia, was established in the seventeenth century on the estate of the Counts Pálffy, an important Hungarian noble family. The oldest documented tombstone at the Jewish cemetery dates from 1642. The community reached the peak of its prosperity in the first half of the nineteenth century. In 1828 it numbered 819 Jews, about one quarter of the local population (total: 3,374). The community maintained an excellent school, which was also attended by non-Jewish pupils. Towards the end of the nineteenth century, the Jewish population decreased, as many young people left Stupava for nearby Bratislava and Vienna. In 1940, the community had 191 members; most of them were killed in the Holocaust, and there is no active Jewish life in the town today. Aside from the synagogue, one of the most significant in Slovakia, visitors can see the well-kept Jewish cemetery with many centuries-old tombstones (Pri Borníku Street). The synagogue was built in 1803 and represents a unique example of the nine-bay type. 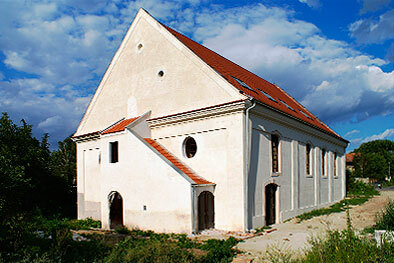 Located in the center of the village, close to the Pálffy family residence, it stands on a deep lot near a creek. Its exterior is a rectangle, with massive walls pierced by simple Baroque windows and topped by a saddleback roof. An interesting detail of the façade are the oval ventilation openings in the gable, a typical feature of local architecture in the Záhorie Region. The prayer hall is a nine-bay space, three bays square, whose central bimah is supported by four columns. The exterior of this unique synagogue was successfully restored in 2008 thanks to the long-term initiative of the Bratislava-based NGO Jewrope. The synagogue is now under restoration for cultural purposes. It will be used as a central archive and book deposit for the Slovak Jewish community. A small Judaica exhibition is also planned.